Your kitchen will get dusty, grimy and in need of a deep cleaning because you spend more time there than in any other room. Since it’s full of hard to reach places, clean-up can get tricky! We’ve narrowed in on two of the toughest areas to clean areas in your kitchen so you don’t have to… Here’s how you knock out your kitchen’s caked-on messes. Busy cooks know the struggle of cleaning a stove top, especially after your hard labored dishes boil over into the coils and trays. 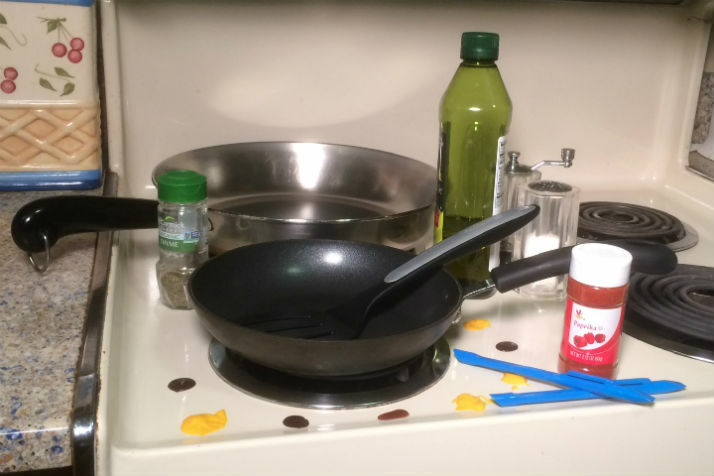 Grease cooked onto the stove is one of the most challenging messes to clean up in your kitchen. The ideal time to act? When the mess has just occurred and the stove top has gently cooled. Grab your Scrigit Scraper cleaning tool, a non-scratch scrubber sponge, a microfiber cloth and warm soapy water. Absorb any grease with the paper towels. Make sure to frequently switch to new paper towels to avoid spreading the grease to new locations. Once most of the grease is cleaned, circle back with your sponge and soapy water to tackle the mess cooked onto the stove. Squeeze the sudsy water over the stain, then let it sit for 3-5 minutes. Start by scrubbing with the scrubbing side of the sponge. Then follow up by scraping off hard to remove dried food and grease spots with the flat end of your Scrigit Scraper. Also use the tool to clean around the edges. Shine with a fresh microfiber cloth once all of the caked-on food stains have been removed. It’s happened to all of us. Food goes flying in the microwave when we decide to rewarm a bowl of saucy food and forget to cover the plate with wax paper or plastic wrap. For the moments when you forget to use a splatter guard or the splatter guard fails, don’t stress! Place a cup of water with lemon slices in a microwave safe bowl or glass measuring cup. Microwave the concoction for two minutes then let it sit (without opening the door) for another two minutes. The lemon will deodorize naturally, and the water will steam soften the cooked on food particles. When you open the door, quickly wipe away any softened sauce and food inside your appliance. Once you’ve done so, follow up with your Scrigit Scraper to easily scrape away any remaining mess. You’ll have a fresh microwave in minutes! Don’t forget, as with any surface in your home, frequent cleaning is always best to avoid caked-on messes. Wherever you face a buildup challenge, keep your Scrigit Scraper easily accessible! Our packs come in multiples of two or five so you can keep one wherever you need it for quick and easy cleanups.